Sarouk Rug — 13 ft. by 9 ft. 6in. Large traditional floral Persian Sarouk carpet from central Iran. Natural wool woven onto natural cotton. Very tightly knotted weave so the rug is heavy and dense, and it can be used in a high foot traffic area, including under a dining room table. Condition is good with some minor wear across the pile. Fringes and side cords are in excellent condition. There are a couple of small nicks in the wool pile about the size of a nickel. I am providing closeup photos (with coin) to indicate size. The structure is intact so there are no holes or weak spots; these are strictly cosmetic flaws, which could be re-piled. As they are hardly noticeable without nose on the rug, they don’t warrant concern. The dyes are of a high quality and not overbearing. Fairly muted red with balanced blues, ivory, tans, and green rounding out the color palette. Mahal, Mashad, Kashan, Tabriz, Isfahan, Kashmar are all cities in Iran that all produce a version of this intricate medallion rug. This one is a Sarouk from the late 1940s – 1950s. This rug is guaranteed to be Persian, it is not a copy from Pakistan, India or China, etc. Click here to purchase this rug in the Shop. Please email me with questions or to arrange a purchase. Price is $699. Shipping is $77 or free local pickup. Classic Persian floral medallion rug from the beautiful garden city of Isfahan, Iran. (Also, Esfahan). Very good overall condition with only a few scattered spots of inconsequential wear. Traditional Isfahan colors with several shades of blue, crimson, black, ivory, cream, silver, and peach. It is difficult to find these large floral rugs in such great condition. Exact size is 11 ft. 10 in. by 7 ft. 9 in. A vintage Persian carpet, most likely from the 1970s. This rug is ready to roll out inyour home. Natural wool pile on natural cotton warp. This Isfahan Persian carpet is $849. Shipping is $69 or free with a prearranged local pickup. Persian handmade traditional carpet from Sabzevar, Iran. Sabzevar is in the Khorasan (also Khurasan) region of Persia, located in the northeast. The name means ‘rising sun’. The carpets are similar to those from Mashad, which is about 220 kilometers to the east. The condition is good with some pile wear on a few areas around the center (the most noteworthy area is shown in photo 3, in some of the red). The wear is minor and merely cosmetic, and there are no holes or weak spots. Rug remains very rugged and ready to use, including in a high foot traffic area of the living room or under the dining room table. This rug is out of a European estate, and has been professionally washed. The fringe and the entire rug has really brightened up with the wash, and the rug needs absolutely nothing to roll out on the floor. With only minor wear this lovely floral Sabzevar had many decades of life left in it. Sabzevar weavers like to work in plush reds and purples, and this rug is very representative of their finest art. This is the kind of motif — a large medallion, elegant corner vases, an arabesque of swirling and twisting plumes and flowers — that most people have in mind when they think of a Persian carpet. Signed by the master weaver on one end, shown in penultimate photo. Last photo, with coin, is the back of the rug. 1950s. Exact size is 11 ft. 5 in by 8 ft. 3 in. The price of the rug is $829. Please email me with questions or to arrange a purchase. Shipping costs are $69. Local pickup is an option, too. Thank you. 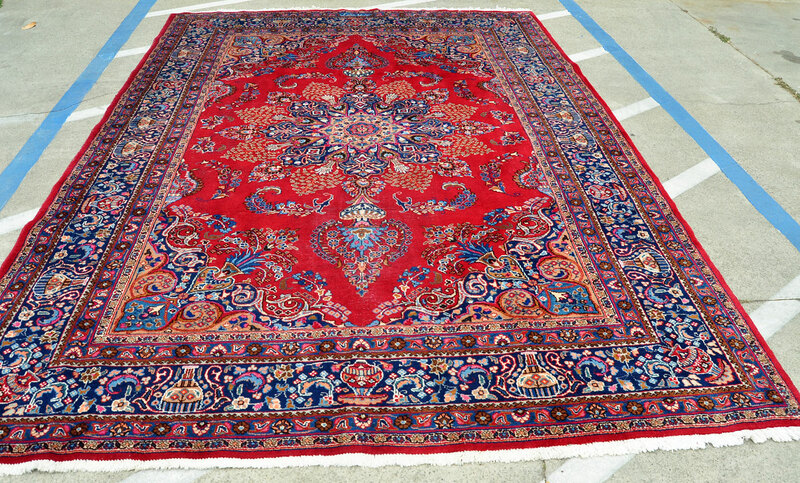 Amazing old Persian village carpet with traditional Lilihan floral motif. Typically these are woven in the Hamadan region by Armenian tribal weavers. 1960s. Outstanding colors including the primary field of salmon — with accents of green, blue, indigo, red, olive, brown, gray and ivory. Very minor fringe wear. Rug is very solid and finely woven, and can be used in a high foot traffic area without concern. Difficult to find well crafted narrow runners — especially of such exquisite beauty. Minor abrash (color variegation in the dyes) with one end maybe slightly lighter than the other. Last photo with Morgan silver dollar shows the back of the rug. Natural wool on natural cotton. Exact size is 12 ft. 5 in. by 2 ft. 10 in. Perfect for a narrow hallway or corridor with lots of light to show off its beauty. Persian Armenians are the largest Christian minority in Iran, and many estimates put their numbers at 150,000 to 300,000. Although Lilihan rugs are commonly associated with Persian Armenian weavers, there is obviously nothing distinctive between Muslim and Christian carpets unless they contain religious symbols such as mihrabs, mosques, churches, crosses, or quotes from the Koran, etc. Many of the Lilihan rugs have an ‘art deco’ look to them and are similar to Sarouk and Mahal rugs– especially from the 1920s and 1930s. Price is $459. Shipping is $43 within U.S. Free local pickup can also be arranged. Please email me with questions to discuss a purchase. Thank you. Classic Persian Kashan run with tomato red field, central medallion, and floral corners and borders. A bit of abrash (color variegation due to different wool dye batches), which lends a rug painterly qualities. The abrash is in the red field as shown in photo 2. Definitely woven in Iran — not a Pakistani or Indian copy. Excellent overall condition for a vintage rug. Minor repair on the side cord, which is not even visible. Wool on cotton warp. 1960s. The last photo shows the back of the rug and you can see that it is a very dense and finely knotted carpet. Exact size is 6 ft. 11 in. by 4 ft. 5 in. Extremely solid and you could place it in a high foot traffic area if need be. Price is $385. Shipping is $35 within U.S. continent.